I’ve been thinking about socks lately, about how they’re something we don’t think about very often if at all. Socks are one of those inventions like those little cards that hang on doorknobs on hotel room doors that say “DO NOT DISTURB,” simple but effective. We don’t know who first thought of these tubes of fabric closed at one end, but I’d like to thank whoever it was. 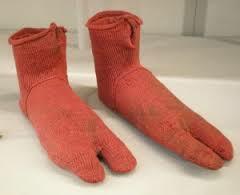 The first socks date from between 300 and 500 AD and they have two big toes for sandals, and they look like a couple of big bird feet. I bet they had fun pretending to be very early Big Birds. my favorite socks have a diagram of the Paris Métro on them. I also have socks with cheeseburgers all over them. You can pick up a pair at Target if they’re still available. But that’s just the beginning—an impromptu sock puppet can entertain a sick child (If the child is not too upset by a puppet without eyes (most of them don’t care). or to polish silver and furniture. Some people store money in them, and others use them as weapons, but I don’t recommend that. Socks have very kindly lent their name to a number of things and expressions such as sock monkey, “sock it to me,” “socked in,” sock hop, socking away money, knocking someone’s socks off (hard to do—I tried once), bless her cotton socks,” (which I guess someone would use if someone else were heartless), pull up your socks, drop your socks, work your socks off, and someone may be a wet sock, a sweat sock, a rubber sock or a Flubber sock (not really; I just wanted to rhyme something), and someone may wear close combat socks (with their close combat boots, I’m sure), and all of us have a thoroughly good time thanks to our friends the socks.